Keto Samoa Cookie Bars! You won’t crave Girl Scout cookies with these delicious low carb bars. An almond flour shortbread crust topped with coconut caramel and chocolate, and easy to make too. This Samoa Bar recipe was first published in 2011. Whoa, dudes, that’s a long time ago now. So they are deserving of an update, and are now lower carb. And prettier photos too! Good old Samoa cookies. What do they call them now? Caramel Delites or some such silliness. Okay, much more politically correct and all that jazz, but practically no one know what you are talking about. However, if you say Samoa Cookies, everyone knows exactly what you mean. So I am calling this recipe Samoa Cookie Bars. It’s got better name recognition and it rolls of the tongue much more easily. That’s my story and I’m sticking to it. Now, I could have made these as low carb cookies instead of bars. But let’s examine that a little more closely. The original Samoa cookie is a circular shortbread cookie with a topping of coconut and caramel. The bottom is then dipped in chocolate and more chocolate is drizzled overtop. That’s a lot of work, my friends! Rolling out the dough, cutting it out into circles, cutting out a hole in the middle, and then trying to top those delicate cookies with the caramel and dip them in chocolate? Tasty and pretty, I am sure. But far too laborious for my taste. Taking all those same elements and turning them into bars is far easier and you get the deliciousness into your mouth that much fast. Win win, I would say. 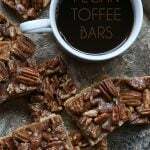 Way back when I first created this Keto Samoa Bar recipe, I thought I was being pretty darn original. I wanted that delicious coconut caramel flavor with a shortbread crust and I realized quickly that a bar cookie would be far less work. Then I did a Pinterest search and I quickly realized that many others have hit upon this same idea. Great minds, right??? But while I may lack in coming up with completely original ideas, I make up for it by taking those ideas and making them keto friendly. As far as I can tell, this is the very first low carb Samoa Cookie Recipe. There are certainly more now, but my samoa bars were the first of their kind! Does that win me any awards? Maybe in my own mind. Obviously a lot has to change to make Samoa cookies low carb and sugar-free. The Shortbread Base: I’ve made a fair bit of low carb shortbread in my day and almond flour makes the best crust by far. When it’s baked with butter, sweetener, and salt, it becomes both tender and crisp, just like conventional shortbread. 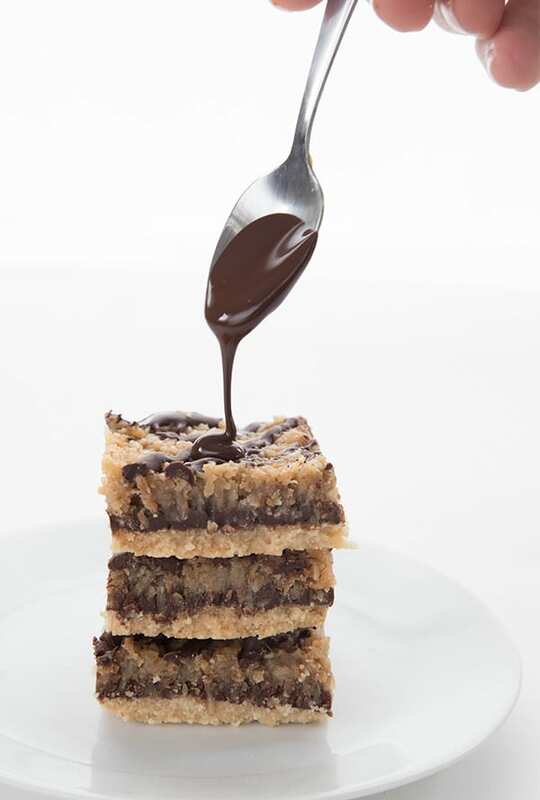 The crust on these Samoa Bars is my favourite and I’ve used it over and over in many recipes. The Chocolate Dip and Drizzle: To make things even easier in this recipe, I decided to do a layer of chocolate on top of the crust. Real Samoa Cookies have bottoms that are dipped in chocolate. But that would mean cutting up the bars after they were finished and carefully dipping them. It would be far messier too. Would your tastebuds really know the difference between a layered Samoa Bar versus a dipped Samoa Bar? I think not. So I simply poured about two thirds of the chocolate mixture over the cooled crust, before topping it with the coconut caramel. The Coconut Filling: Samoa Cookies are now called Caramel De-Lites because of that delicious coconut caramel topping. I’ve got one of the best sugar free caramel sauce recipes and it’s perfect for these bars. 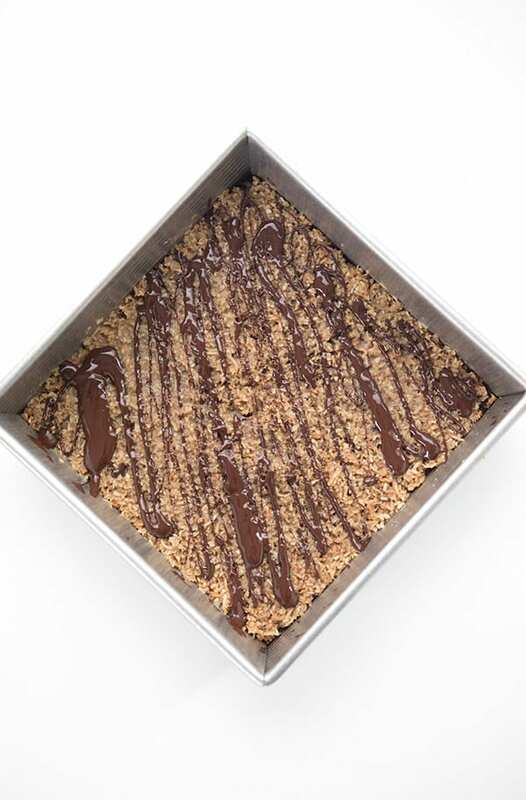 Stir in some toasted coconut and spread it over top, and drizzle on a bit more chocolate. And Voila! A delicious low carb Samoa Cookie Recipe. In bar form. Trust me, your tastebuds won’t care! 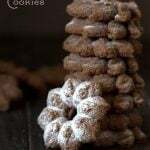 So if you’ve been missing Girl Scout Cookies on your low carb diet, try this easy recipe. You won’t regret it. Keto Samoa Cookie Bars! 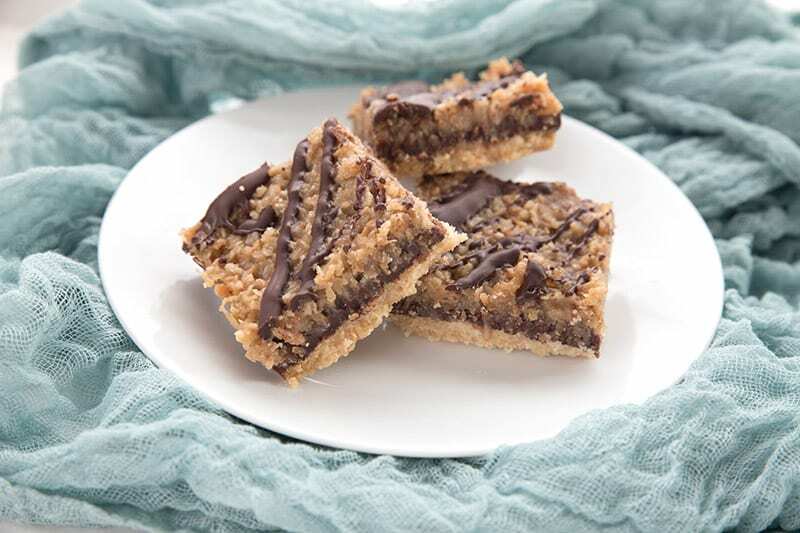 You won't crave Girl Scout cookies with these delicious low carb bars. An almond flour shortbread crust topped with coconut caramel and chocolate, and easy to make too. Preheat the oven to 325F. In a medium bowl, whisk together the almond flour, sweetener, and salt. Stir in the melted butter until the mixture begins to come together. Turn out the mixture into an 8x8 baking pan and press firmly into the bottom. Bake about 15 to 18 minutes, until just golden brown. Remove and let cool while preparing the filling. In a small microwave safe bowl, melt the chocolate and coconut oil in 30 second increments, stirring in between, until melted and smooth. Alternatively, you can melt it double boiler style over a pan of barely simmering water. Spread about 2/3 of the chocolate mixture over the cooled crust. In a medium skillet over medium heat, spread the coconut. Stirring frequently, toast until light golden brown. Set aside. In a large saucepan over medium heat, combine the butter and sweeteners. Cook until melted and then bring to a boil. Boil 3 to 5 minutes, until golden. Remove from heat and add the cream, vanilla, and salt. The mixture will bubble vigorously, this is normal. Stir in the toasted coconut. Spread the mixture over the chocolate-covered crust. Let cool completely (about 1 hour), then cut into squares. Gently reheat remaining chocolate mixture and drizzle over the bars. Ingenious! Maybe you could try working that caramel sauce into my Budino? These look so good….. they are my favorite girl scout cookie. Looks even better in bar form. YUM. Ohhh, they look/sound delicious!I have to try those soon – very soon! 🙂 Thanks for the recipe! Oh yum! Your bars look perfect! Amazing how you can almost never come up with anything original. I'm thrilled you posted your "unoriginal" recipe. I would have never thought to do this and they are my favorite cookies! Drooling over here. Well done. I love Samoas, so I have this bookmarked to try! I hate it when you think of something and then see it on a blog days later…I always feel like it will look like I'm "copying"…ha. Each and every element of these bars sounds so tempting…I can imagine they combine to make a wonderful treat! I feel the same way. I made those salted caramel brownies not too long ago and then all of a sudden I see salted caramels, and then salted brownies. Haha, I hear ya lady. No matter what you do it always seems you thought of it last. But your blog is very original, don't forget that. Even if you might have a similar recipe to someone else. I find your blog one of the most unique. One of my chef instructors is always say we are all copycats because there is nothing new under the sun! Look delicious to me! Stunning. Absolutely stunning! AND they're low carb and gluten free? You are brilliant! Oh, you have made many, many people happy today with this recipe! My favorite GS cookie…and you've miraculously made them low carb and gluten free and DELICIOUS!!! Buzzed and stumbled these winners. Those look so good! mm.. the caramel filling makes me drool..
oh my god these look amazing!! i just started liking the samoa girl scout cookie. i bet these are even better! I know exactly how you feel when creating a new recipe. Or so you thought! I feel so naive when I realize it's been done numerous times, but I hadn't heard of it yet. Like when I thought I was on to something special by putting coffee in a spice rub. 2 days later I saw Bobby Flay doing it. Back on subject; these bars look delicious! These are incredible. I can't get over how moist they look. You really knocked this one out of the park. I know your frustration, many of my wonderful ideas have already been thought of too. But you definitely made these bars your own. They look amazing! Yes, I guess that when it comes to recipes, with so much of them around, we find it hard to come up with very original ones, those never before seen….but I suppose the difference will be evident once we taste the food 🙂 The originality there is very distinguishable. 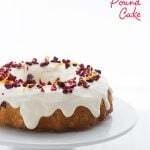 I think if you can put on a gluten-free twist on things like this, then that is original! But, really, I feel the same way about a lot of what I post. At the same time though, just because I've heard of it, doesn't mean others have too! So, keep doing your thang!! Btw, Samoas are my favorite GS cookie so I love these! Carolyn….isn't that always the way! You think you come up with the most brilliant revelation only to find it's been done before! But you certainly made these your own! They are just beautiful! Caramel and coconut…it just doesn't get any better than that! I actually quite like that nothing is ever 100% original…it adds to the fun of the endless combinations of ingredients, the slight tweaks to a recipe that change the end result, and the fact that you can just have fun with food combinations. great job making these healthier! You must to proud of them because they look amazing! It is tough to be original in such a busy world….love the bars though. You always have great adaptations. This look insanely good! Your photos are so alluring too. Love knowing you've already dealt with the gluten free modifications so I don't need to! Thank you. What a GREAT idea. I made Samoas scones ones – but these are much prettier. Could I sub AP flour for the almond flour? Ooohhh! I just love your blog! These are my favorite GS cookie and I can't wait to try these. You fuel my imagination to create and try to make all my favorites into low carb creations. You are my muse…Brava! 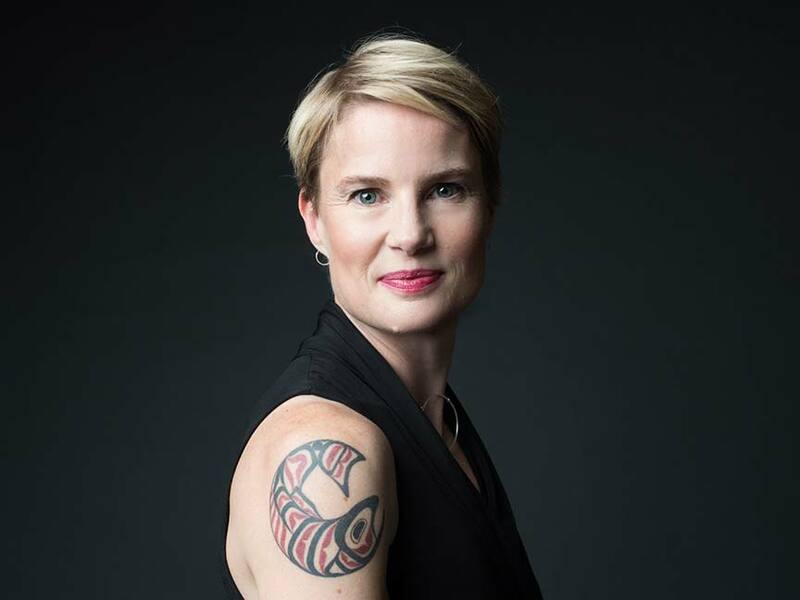 Carolyn, Low-carb? I'm in! This is a terrific, approachable recipe and I thank you for sharing it. Spike the flavor while keeping the guilt in check! 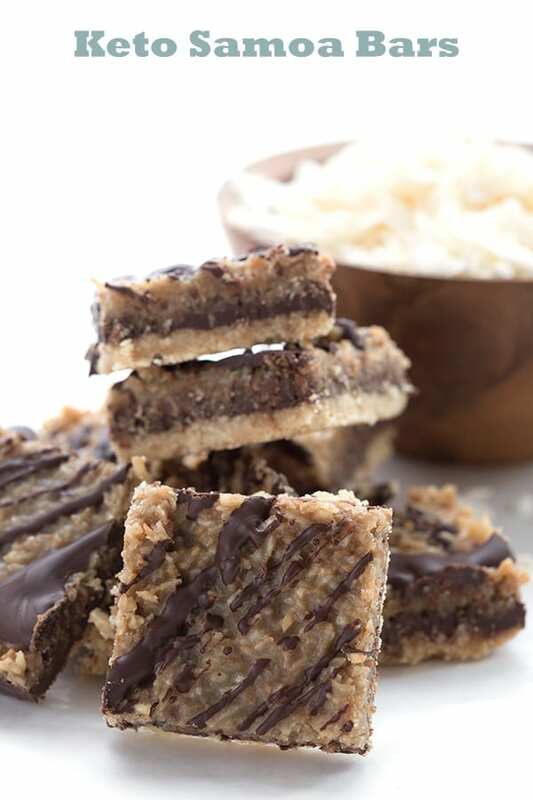 Your Samoa bars look so good and they're low carb and gluten free, too. Who cares if it is not original. A good thing is a good thing. I love the girl scout cookies. Yours are beautiful. I don't think I have seen any before with the layers like yours! Lovely! Carolyn, those bars look heavenly, and I can't believe how easily you transform baked goods into gluten free low carb taste sensations. These are a wow for sure! These look delicious – I run across the same thing…I think I've made something new – and someone beat me to the punch! Just mouthwatering…looks so easy to prepare and delicious. Your photos are amazing and I don't care if that was original or not! I think it all just means that old saying 'great minds think alike'. Or at least that's what I keep telling myself! 😀 These bars look awesome – chewy and delicious! I know! I always think that I'm being super creative, only to find out that I'm not 🙂 These bars look delicious anyways, I love Samoas! It's so hard to come up with a truly original recipe…but looks like you've definitely made these your own. They look absolutely delicious and love that they are low carb and low sugar – definitely a keeper! Yet another fabulous recipe winner, Carolyn. You always manage to give them your magic touch by making them low carb and full of imagination. Fabulous! These bars look delicious – but I really love your thoughts on originality. It's one reason I stick to the old books – easier to rework a classic than reinvent the wheel! Everything you do has a unique edge to it 🙂 These look so fun and delicious! I was very excited ti see this post–what a fantastic idea! I LOVE Samoas, but it's been years. So I made them tonight (they're cooling as I type), and I ran into a snag bear the end. I wonder if you could be a little more specific in your directions regarding the caramel. I realized too late that the molasses darkens the erythritol, so that it's impossible to say whether the erythritol is itself getting too dark or not. I ended up taking it off the stove before it bubbled, although probably after it had cooked five minutes. After I stirred in the cream etc. it was still quite liquidy, almost water-like in texture. Is it supposed to be liquid, or more viscous like real caramel? I stirred in the coconut and proceeded with the recipe. It is now cooling and acquiring the typical grainy texture of erythritol-based concoctions. Is that how yours turned out or did you miraculously achieve true caramel texture? P.S. I am the Catherine who asked about replacing soy flour in your zucchini muffin recipe, and I did see your comment, thanks! I'll let you know how those turn out soon, because now I have two huge zucchini hanging out in my fridge. Excellent point about the caramel, I will amend the instructions. Yes, you definitely need to wait until it bubbles and it can take a bit of time to do so, otherwise it won't be the right texture. 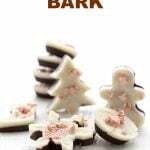 It will still harden up some in the end, as all erythritol concoctions do, but once you've added in the coconut and spread it over the bars, it stays soft enough for biting into. It never gets that chewiness that comes with sugar caramel…sadly, erythritol just doesn't work that way! But it is definitely good on these bars. I know exactly what you mean! I actually made some Samoa bars when I first started blogging and I totally thought I would have been the first. Regardless- yours look gorgeous and your pictures, as always, are stunning! Great post. I'm sooo pumped to have found your blog and to try this recipe!!! THANK you so much!!!! OMG I made these the other night and they were soooo good. 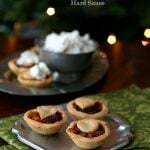 I made some with chocolate and some with raspberry jam because my hubby is allergic to chocolate–both were fabulous! Thanks Carolyn for yet another amazing low carb dessert! Sadly, these did not work out for me. Some of it may have been my fault–I did not cook the caramel long enough because I was nervous about it burning–but I think mistaken expectations may also have set me up for a fall. Samoas are my BFF among girl scout cookies, so I was keenly aware of every difference in texture and taste. The shortbread base was not at all crunchy or cookie-ish, but soft (very like the peanut-butter caramel bars) and too thick. The combination of erythritol-sweetended chocolate and erythritol-filled caramel was too much for my mouth, and I eventually received a burning sensation. 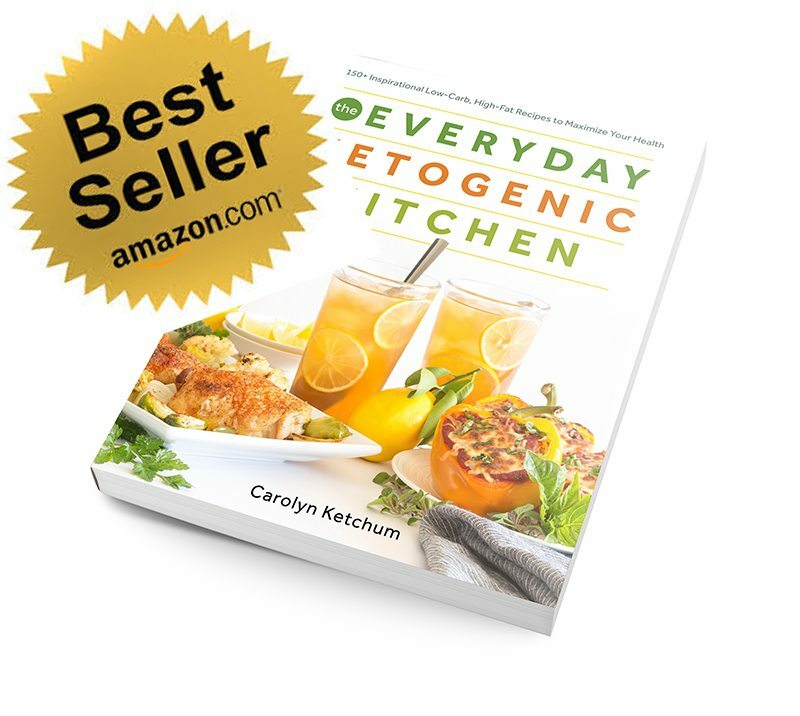 This is a phenomenon that only some people seem to experience when eating erythritol–other people who tried the same dessert didn't know what I was talking about. (I wonder if it's a genetic thing, like smelling asparagus in one's urine . . .? To avoid this feeling, I often substitute xylitol, which does not seem to affect me that way.) I wanted to like these, but I just couldn't. I made these two days ago and they are amazing. I refrigerated them last night and they are even better when chilled. Bravo – this is my new favorite low-carb "sweets" recipe! These look delicious and I would love to try them, but do you have any suggestions for substituting for molasses? Thank you for such fabulous recipes! You really need a little something to get it going…honey or maple syrup would be fine too. It’s more about getting the caramelization process started. Do you think Agave would Work? I have a nice dark agave syrup on hand. I can’t say for sure but you’re certainly welcome to try it out! OMG, these look delicious and I would love to try them, but do you have any suggestions for substituting for molasses? Thank you for such fabulous recipes! For this recipe, you could really do cup for cup. Hi there! These look Amazing!! 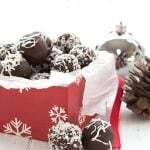 Instead of making the chocolate, could I just buy sugar free chocolate to use? It would save me some time and money! Thanks for the awesome recipe! I don’t have one but I am sure you can google it. Where does it say 7 cups of flour? My first try was … well, improvable, the crust was very hard. Maybe I got the cup -> metric conversion wrong or it was in the oven too long. My question is: Do you have some conversion for your Stevia extract like “1 drop = 1 tsp sugar”? Then I could convert it to my Stevia tablets. Not really, but I can say that 1/4 tsp (and this would be about 1/4 tsp) is equal to about 1/4 cup sugar. Does that help? Oh good, I am so glad they weren’t hard to make. Trust me, I know all about trying to keep kids off the sugar-y storebought stuff. Sometimes I am successful, but sometimes…not. Finally got around to making these today – just wonderful! My eldest adult son, who sneers at my “low carb stuff”, liked them too. They do take a bit more time than other treats since there are 3 layers. Not difficult, just time consuming compared to say, the cookie skillet. But well worth it! Worked out the math but haven’t made them yet. So excited to try this recipe!! I new favorite of mine! I loved the mixed textures. Do you think I could replace the whipping cream with full fat canned coconut milk? I can’t say for sure but people have said they’ve had good luck with a lot of my caramel recipes doing that. So I say it’s certainly worth a try. These are wonderful. I have a stash of favorite bar recipes and this one goes to the top. 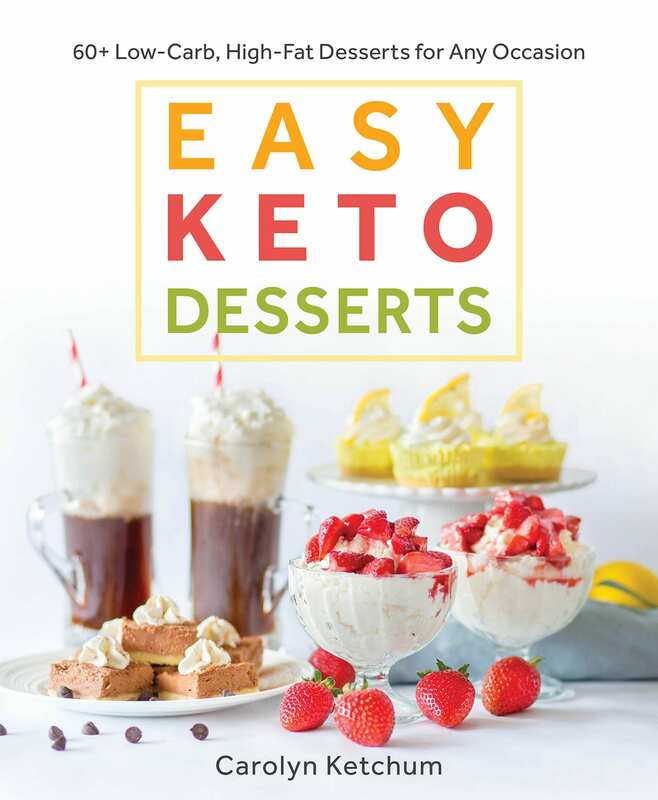 Thank you for all the time you invest in providing great recipes for us keto diabetics. There is a special place in heaven for you. There is no print button!!Help!! This is an older recipe from before I had a print button for them. All you need to do is cut and paste into a word doc. First time cooking with artificial sweeteners and it was a disaster! 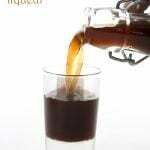 The erythritol and molasses burnt before bubbling – even though I was stirring constantly over low/medium heat. Is there a trick that I need to learn in working with these ingredients?! This is a very old recipe that I haven’t had a chance to re-visit in a while but it may have been the brand of erythritol you used. I always use Swerve. Can I use Lilly’s milk chocolate melted with cocoa butter for the chocolate layer and drizzle? Sure, that would be fine. I have an updated version of this coming soon. This recipe made my day. I made these tonight. Oh my word! They were slap your mama good. This kind of cooking makes keto totally doable forever. Thank you for sharing! I had my daughter try these. She said that they taste more like an almond joy instead of a somoa/caramel delite. Is there a way to get them to taste more like caramel? They taste like samoas to us. 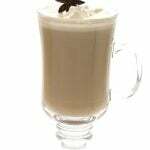 have you tried this upated recipe or the old one? You can always try a bit of caramel extract. Melissa, I haven’t made these, but I have made many batches of Carolyn’s caramel sauce and different variations thereof. Be sure that you’re making the caramel sauce properly, allowing it to cook, caramelize, and deepen in flavor. It really will taste like caramel when it’s done. A weaker sauce makes a big difference in finished recipes. As an example, Carolyn has a salted caramel macaroon recipe, and I was able to make it taste like classic macaroons by cooking the caramel less, so it tastes like a rich cream-based sauce rather than caramel sauce. It should firm up as it sits. What sweetener did you use? If you’re truly worried, try adding a teaspoon or two of coconut flour to thicken it. Is there a dairy free way to make this recipe? Just found out I’m interolant to dairy and eggwhites (though I know there isn’t any eggwhites in this recipe. Could I use coconut oil or vegan butter and coconut cream fat fat in place of butter and whipped cream? I actually have a dairy free version of this recipe coming in a future cookbook but I am not allowed to share it at this point. I’m so excited, these are my fav GS cookies!! BTW– They’re still called Samoas, kinda. The girl scouts used to exclusively use Little Brownie Bakers, the cookies from there are still Samoas. However a few years ago they started using a 2nd Baker, and the cookies from that company are the ones called Caramel Delights. Copywrite issue I guess? The first time I made the caramel, it burnt after boiling for 4 minutes. The second time I made it, I probably underboiled it because it ended soup-like. Is there a temperature I should be aiming for? I have a candy thermometer. Thanks! I didn’t do this by temperature. You simply boil until you see it become like a deep amber. Can you get any closer to heaven with these bars! I mean seriously!! Samoa’s are my favorite cookie! 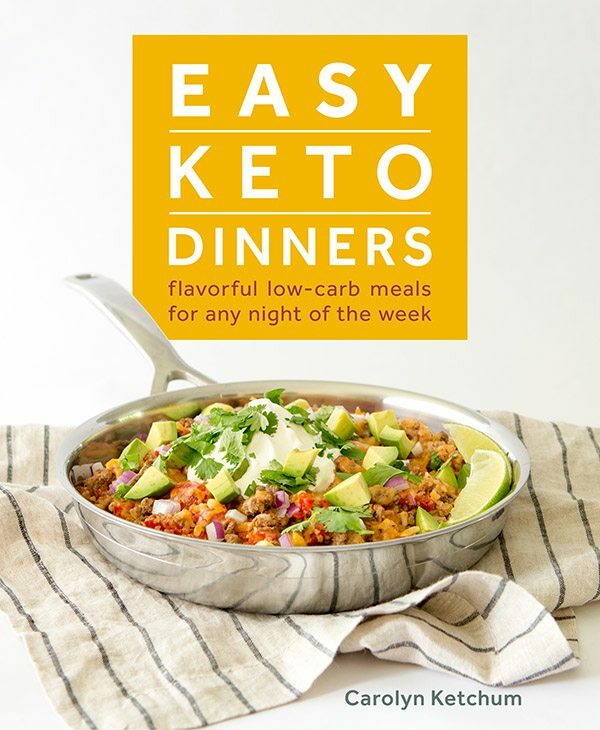 I’m so glad I found this Keto version! Girl scout cookie time is a dangerous time of year – love this recipe! These are so good! I may have eaten the entire pan myself… so good! Sadly not a bit of this recipe worked for us. The short bread is super super dry and powdery. No real structure. The rest of it didn’t really firm up much. I think the main problem was the short bread. Had that worked out the rest of our would have been pretty good. Sorry to hear they didn’t work but if your crust was “super dry and crumbly” then something went very wrong. What brand of almond flour did you use? How long do these keep? And does the caramel layer harden? I’d want it to still be a little chewy. Definitely wanting to try these! As long as you use Bocha Sweet for half of the sweetener, they will be soft and a bit chewy. They can keep on the counter for up to 5 days. Could I double this recipe and use a 9×13 dish? Or would it better to go through the steps twice? Also if you use extra swerve instead of BochaSweet does it still stay soft? Thanks much! Yes, you should be able to double it. The area of a 9×13 pan is 117 and of an 8×8 pan is 64 (2×64 = 128). So your bars will be a little thicker because you have a little less area. But close enough. Without Bocha Sweet, your topping will harden. Carolyn you might want to correct Drizzle recipe? The “Sugar-free Chocolate”…is that sweetened (non-sugar sweetener) or not sweetened? Unsweetened chocolate, with no sweeteners whatsoever, is always listed as unsweetened chocolate. Sugar-free is sweetened… just not with sugar. If you click the link, it will take you to the example of what I used. Love them! I’m on batch two prep, think I’m going to use bigger pan. Trying to thin out bars and stretch this out a lil bit. First batch gone in a jiffy! Thank you so much for always providing amazing, easy-to-follow recipes that turn out delicious every time. 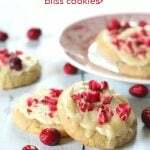 I want to make these for my grandparents since they are diabetics and love the traditional GS cookies, but I don’t have Bocha Sweet. Could I substitute xylitol instead like you have suggested for your turtle candies? Yes, it should be fine for this. Not sure what happened, but the caramel didn’t thicken & was thin & runny. I’ve made your caramel sauce before & it turned out great. I followed the directions exactly, but for some reason it never thickened. If this happens again, would ¼ tsp of xanthm gum save it? The bars are tasty but are missing the soft chewiness of the caramel. Sure, you could try that. I’m definitely giving these a try tonight! Except now I think we are calling the MOMOAS 🤣🔥. I’ll probably add pumpkin spice, because I add it to everything. But I love your blog and your recipes. The absolute BEST sugar-free dessert we’ve tried since going low-carb. This was a hit at the potluck party we attended tonight. Even the non-low-carbers loved it. Thank you thank you thank you!! This were absolutely amazing. These are my fave Girl Scout cookie so I was so excited to try this. I was Keto for year before getting preggers and now I’m back post baby. After countless Keto recipes being made and my non Keto husband being forced taste tester he declared these were thd best of anything I’ve ever prepared. They are delicious and pretty foolproof. 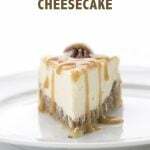 By far the best dessert recipes I found are on your site. Thanks! Thank you, thank you! Enjoy these so much, along with the Tagalongs! I love the shortbread dough. 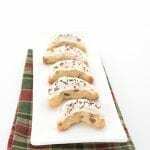 I’m wondering if you have a similar shortbread recipe for thumbprint cookies? I miss those being in the low carb world :). thanks so much, really appreciate all you do!! !